It’s just two days away and I still haven’t got a clue with what I’m wearing on Valentines day. Usually I go out and buy an outfit that I probably won’t wear again but this year I’m all about transitional outfits and so I’m picking carefully. It’s still freezing cold here in London so I want to keep my outfit practical and not too ‘oh hey, look at me trying so hard to impress you’. I’m teaming up with Brantano today* who have a great selection of ankle boots, perfect for the weird weather at the moment. What really sold their site to me though is that a lot of their shoes are wide fit which for me is a serious godsend. My feet are extremely wide and I struggle to find comfortable shoes in most shops. Sad times really but not so much now that I’ve found two lovely pairs that I’m definitely going to be purchasing. 1. I’m absolutely loving these burgundy wedged ankle boots from Brantano. They’re so easy to dress up or down and the wedge means that I won’t end up with aching feet by the end of the day. I’ve never been a fan of any shade of red, I don’t wear it and usually stay away from it but ever since marsala was the colour of the year last year, it’s really grown on me. 2. ‘Shop Dixi’ give me all sorts of feels. I wish I was rich enough to buy out the entire store because I literally want all of their jewellery, especially their rings. There’s something about boho jewellery that’s so intricate and beautiful. At the moment I’m lusting over this Amica Mea ring which would look good with everything! 3. This valentines I’m keeping it super casual. No LBD’s, nothing uncomfortable or awkward to wear. As I said earlier, transitional is what I’m looking for and this pleat and lace blouse (Oasis) is just that. It’s smart enough to wear to something a little bit fancy but also something I could wear to work. 4. Keeping in line with the casual theme, this next dress is perfect. I’ve already told you all how much I’m loving pinafores this season, so this burgundy cord pinafore dress from Topshop is exactly what I’d wear for a casual day out. I could dress it up a little by wearing a blouse underneath or keep it casual with a t-shirt. The possibilities are endless! 5. Although I usually tend to steer clear of heels,it’s always nice to crack them out on an occasion. Unlike most girls I don’t have an extensive collection but when I saw the Emilio Luca X Red quilted ankle boots I went straight to add them into my basket. I love the quilted panel at the back and have already imagined 10 different outfits I could wear them with! 6. New Look premium jewellery are doing everything right at the moment. All their pieces are really beautiful but this stacked bracelet in particular is stunning. I need it in my life! 7. Last but not least, the Sister Jane Lady V High Neck Lace Smock Dress available on Asos is one of the prettiest dresses I’ve seen at the moment. 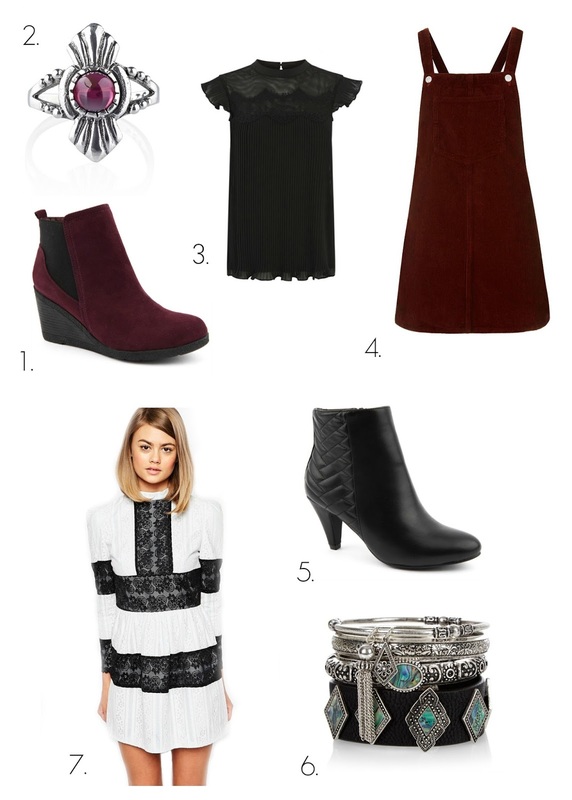 Teamed up with a pair of knee high boots, this outfit would scream Parisian chic all over.